Cowabunga dudes! 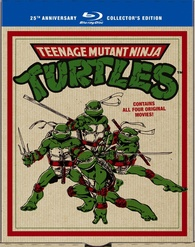 This week's Amazon Blu-ray deal is full of raw turtle power! Amazon is selling 'Teenage Mutant Ninja Turtles: 25th Anniversary Collector's Edition' for $27.99 (57% off the suggested retail price). Housed in a pizza-style box, the set includes: 'Teenage Mutant Ninja Turtles,' 'Teenage Mutant Ninja Turtles II: The Secret of the Ooze,' 'Teenage Mutant Ninja Turtles III,' and 'TMNT,' plus collectible cards and a beanie. Click here to get your dose of childhood nostalgia today! This offer is available from now through September 24.